Right foot forward...at Larvotto. A family in step with each other. 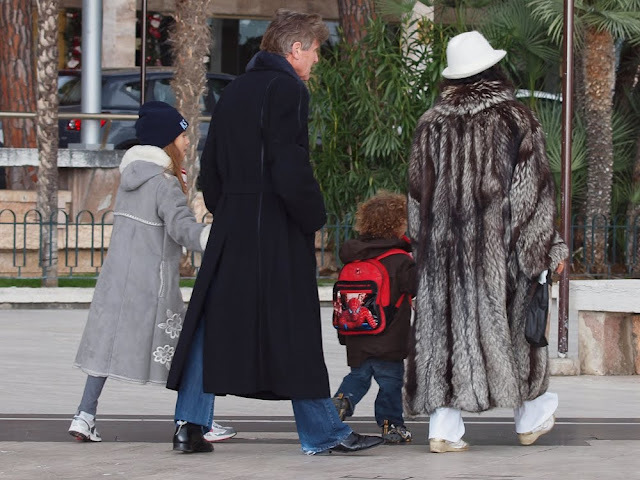 Regrettably more fur, but you'll always see real fur in Monaco - perhaps this coat isn't? I saw a couple yesterday, who I also took a photo of, and I could have used the same text as a title. Is it really THAT COLD where you are?? Is it cold enough there for the fur armament? I inherited a beautiful fur coat but am reluctant to wear it. Who knows how many people with paint cans lurk out there? The other reason, of course, is that our family is steeped in animal love. This photo was taken on the 1st January but it's still chilly so it wouldn't surprise me if I took it today this family would be wearing the same clothes. Chilly by our standards, you understand! You photo is great, as always, but I am particularly interested in reading the comments about fur, with which I agree. I wonder what type of values and attitude the small child in your photo will have when he grows up. It is the contrast which makes me smile: Full length fur (ugh) with white jeans, shoes and hat, Long black coat with frayed jeans and could the girls coat possibly be suede? I keep going back for another smile. Is it that cold in Monaco?! Maybe they're training the kids to march in step so they can be in the Monaco marching band, non?